Just Camping Out: Day One at Spruce Row Campground, Ithaca, NY -- our first time here, so far so good! Day One at Spruce Row Campground, Ithaca, NY -- our first time here, so far so good! My wife decided it was time to try a new campground, and she wanted to tour the Ithaca region a bit this year. 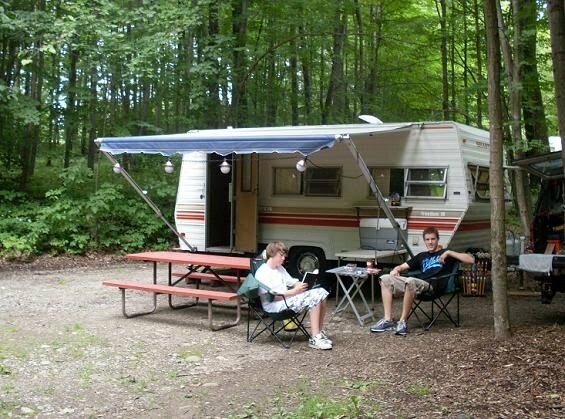 I did a Google search for "campgrounds near Ithaca NY" and here we are. First impressions: it's big and shady and not too shabby at all. Of course I checked a few user reviews first, but they ranged from "love this place" to "never again." We just had to see for ourselves. We waited to make reservations until late last week. It's the 4th of July holiday week, so we could've been shut out. Instead, we have a pretty nice site. Grassy, shady, and big enough for truck and camper and us. The layout is typical. 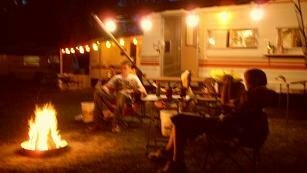 All the services and amenities greet you on arrival, with campsites laid out in a series of roads farther back. Decent roads, too, mostly good gravel. Registration was fast, friendly and easy. Good little store inside. The whole place is just filled with trees of all sorts. I love trees! So far we're settled in nicely. Our new camp doggie, Layla, has had a fine walk on a maze of grassy trails marked for her use. The campers around us are courteous, though one did have his music cranked a little too loud for a while. We'll check out the showers and pool today, our first morning here. Take a longer walk around the whole place--it's quite a spread, with over 200 sites both seasonal and transient. Then we'll become Ithaca tourists and have a look around this beautiful Finger Lakes destination. I see a whole batch of wineries, restaurants, and state parks scattered all around us. Should be fun! Where there are tree all is good in the world. Hope you had a great time!